Dental Insurance is a foundation that will help secure your oral health for the future. Dental insurance is a great adjunct to providing preventative and maintenance of your dental health. Dental insurance can give you peace of mind when unforeseen accidents occur. Partners In Dental Health works closely with in network insurance and out of network insurance to maximize our patients benefits. Our dental insurance coordinators know a vast amount about your insurance and can assist you if you need to use your dental insurance. Our office will file all of your claims and process them so you don’t have to. Our dentists want what is the right treatment for each patient and will provide all the diagnostic information to your insurance to support the treatment that is needed. 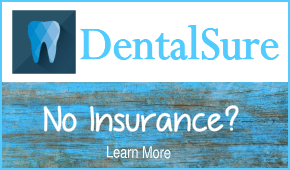 We will file for any PPO insurance and are in network with Delta dental insurance, Metlife dental insurance, Cigna dental insurance, Anthem dental insurance. We will file with insurances Aetna, Principal, United Concordia dental insurance and United Concordia Tricare dental insurance. We are out of network with these insurances but we have had good relationships with them and are able to work with them on your behalf. Being out of network might cause your co-payment to be more at times for certain procedures. To help we contact insurances prior to treatment to verify coverage and co-payments for our patients. Join our membership club. If you are retired or without insurance, DentalSure is a discount plan right for you. Save money every visit. Available at our all our office’s.